Grumsen Equipment has more than 70 years of experience in servicing cargo boats, off-shore installations and fishing vessels. The company works in facilities located at Esbjerg harbor. Engine overhaul includes disassembly of motor block, refurbishing of cylinder heads, cylinder liners, pistons, connecting rods, main bearings and valves. Cleaning in- and outlets, replacing components, greasing and reassembly of engine. Maintenance of drive shafts, including propellers and bow thrusters, is also an area of which Grumsen has great experience. Grumsen has refurbished drive shafts with diameters of up to Ø 2500 mm and lengths up to 6000 mm. Upon agreement of task and date, Grumsen disassembles the engine at customer location, transports parts to facilities at Grumsen equipment, refurbishes as agreed upon, reassemble parts, transport back to vessel, and reinstalls parts. Grumsen Equipment is also capable of cleaning and testing nozzles, when engines are in for service. Our machinery is specially designed to test the nozzles capability, because a well performing nozzle are essential for a good engine performance. 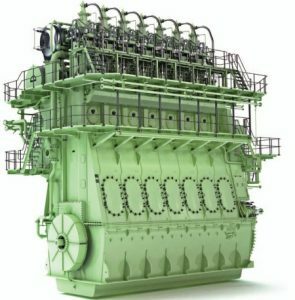 If issues occur during refurbishment, Grumsen Equipment contacts owner/captain for clarify cation of how to proceed with refurbishing of engine. this procedure is to secure owner/captain and Grumsen equipment from any misunderstandings, due to changes in scope that are not specified in original contract.